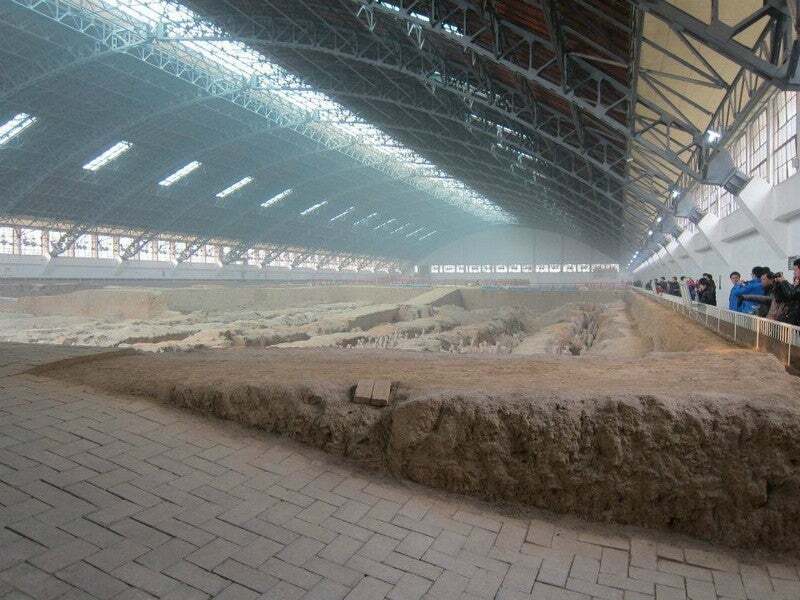 Pit 1 (out of 3) at the Terra Cotta Warrior Museum–the largest and most awe-inspiring. After two days zipping around Shanghai, I caught a quick China Eastern flight (more on that in another post) to Xian because I’ve always wanted to see the famous Terra Cotta warriors and the mausoleum of the first Emperor of China that were discovered in the area in the 1970’s. Diana and me getting ready for our city tour. I didn’t spend too much time there, though, since there was a lot to see and not much time. 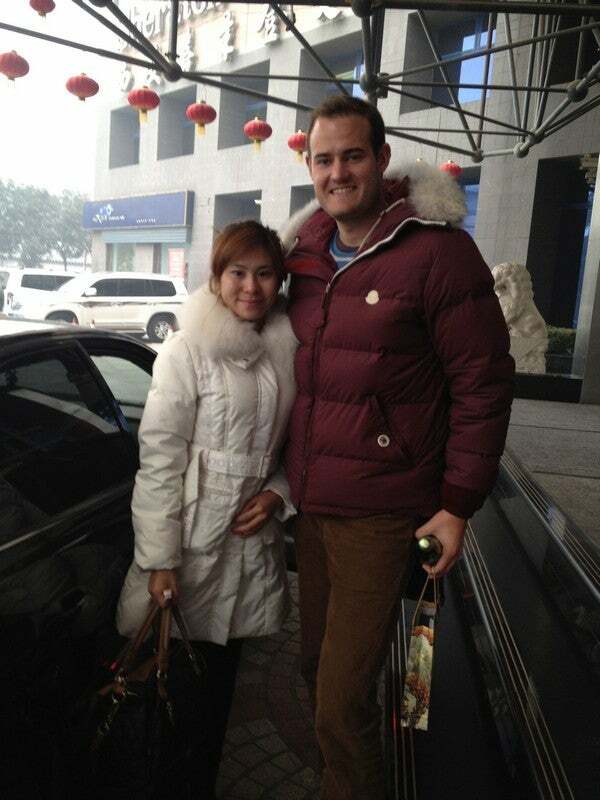 I had hired a guide named Diana (you can email her at jingjingfriend@126.com if you want to book a tour–I highly recommend her) and her driver for 700 RMB ($110) for the day to take me around the city and to the Terra Cotta Warriors Museum. We started at Banpo Village, a 6,000-year-old settlement whose ruins were rediscovered and excavated in the 1950’s. There are dozens of houses, tombs and storage pits and displays of the artifacts and tools the people who lived there used. It was very cool seeing a Stone Age village and how these people lived, as well as to think about the fact that Chinese scholars estimate there are hundreds of other sites in the area very much like it. The first and largest pit of warriors. They estimate there are thousands still buried in here. After Banpo, it was time for the main attraction, the terra cotta warriors and the tomb of the Qin Emperor who first united China, where we spent the rest of the morning. 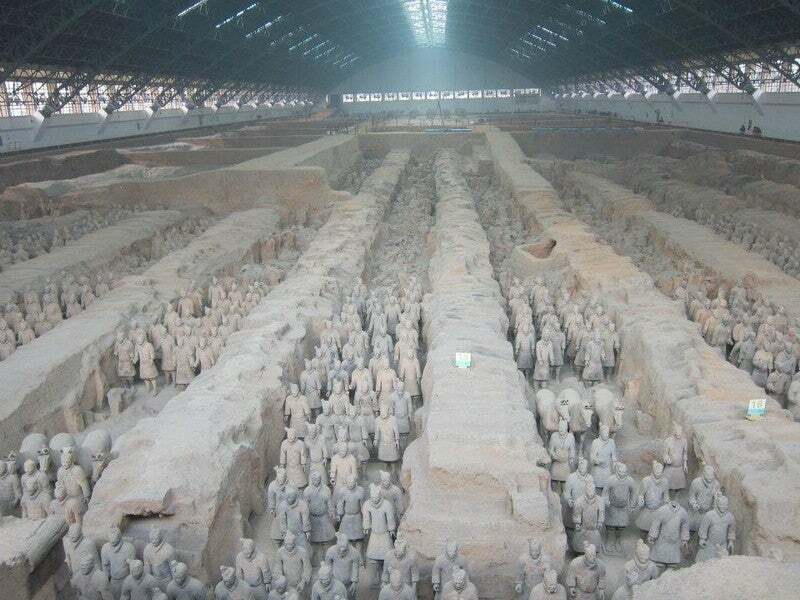 I knew that the museum and excavation site were huge, but nothing prepared me for just how enormous the pits and how many warrior and horse statues are there—and those are just the ones they’ve been able to unearth! 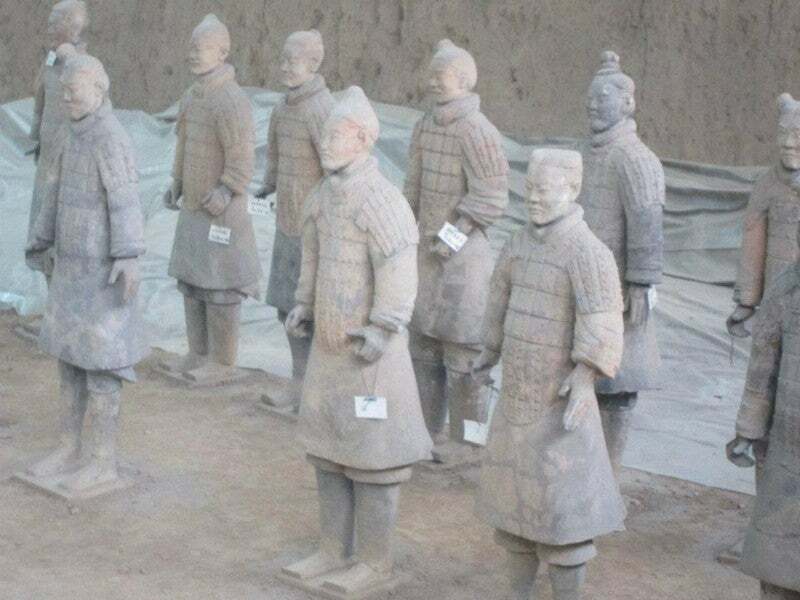 It’s estimated that there are around 10,000 sculptures in the entire complex, most of which are still buried, and which depict figures from all walks of life and society from 210 BC or so when the Emperor died. It’s like an entire terra cotta civilization. Some of the warrior’s in the museum’s “hospital” section who are getting fixed up to put back on display. It was interesting to hear the history of the warriors and that in the even older days the emprorers would actually bury their real life warrirs and concubines- alive- when they died! Qin wanted to be humane, so he decided to create life-sized, ornate clay warriors instead. When they were discovered, they were all shattered, but they’ve been meticulously reassembled and the site of them all together is really awe-inspiring. We spent most of our time walking around Pit #1, the first and largest of the excavation sites, and it was just plain amazing with warriors in all shapes and sizes, and even a little sculpture “hospital” where damaged ones were being fixed up. The other two pits were smaller and less “put together”. 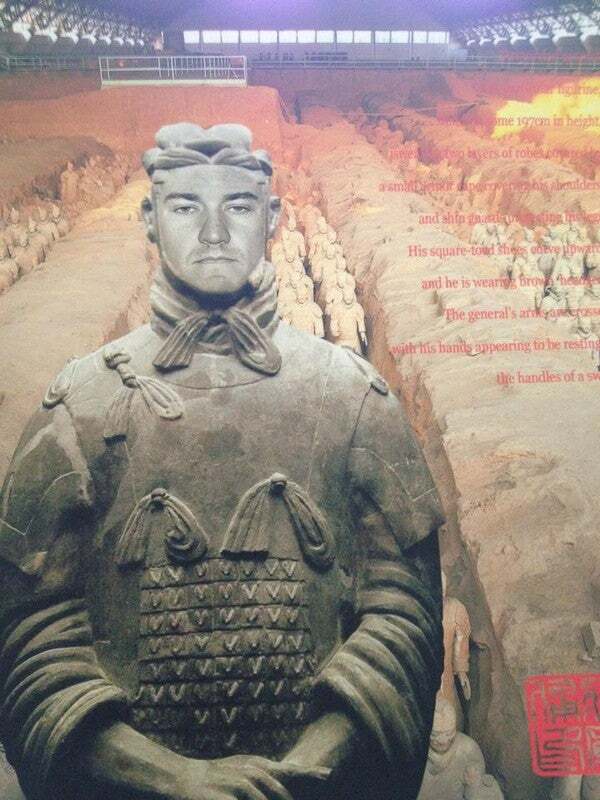 There was a shop where you could get your photo turned into a warrior and I just couldn’t resist. I hope you all get a good laugh since I spent $15 on this doozy! The whole experience was breathtaking—not only in scope and scale, but also because neither this museum nor the Banpo Village one was heated! And it was in the 20’s that day, so we had to keep walking and talking briskly not to freeze. 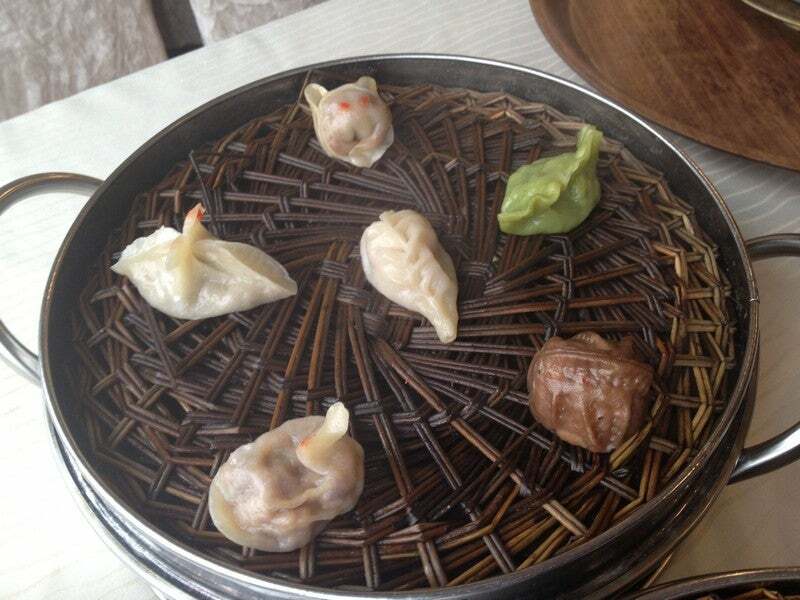 Assorted dim sum at lunch, just what I needed to fortify me for more sightseeing. By the time we finished with the warriors, it was time for a good hot lunch of assorted dumplings back in town. I can’t remember the name for the restaurant, but if any of you read Chinese and can translate, I’d love to know since we had a good meal there and the dumplings were delicious. 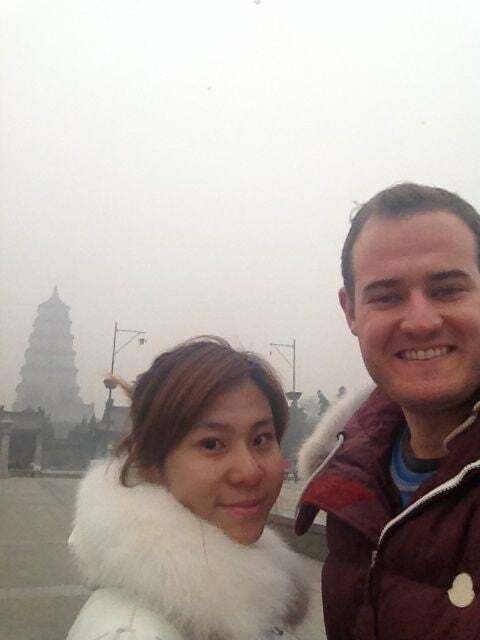 My guide Diana and me at the famous Big Wild Goose Pagoda. It’s so smoggy! After lunch, we spent the rest of the short afternoon walking around an older section of town and seeing the Giant Wild Goose Pagoda, which is one of the city’s famous sights, and is kind of like the Leaning Tower of Xian since it lists to one side thanks to a large earthquake hundreds of years ago. 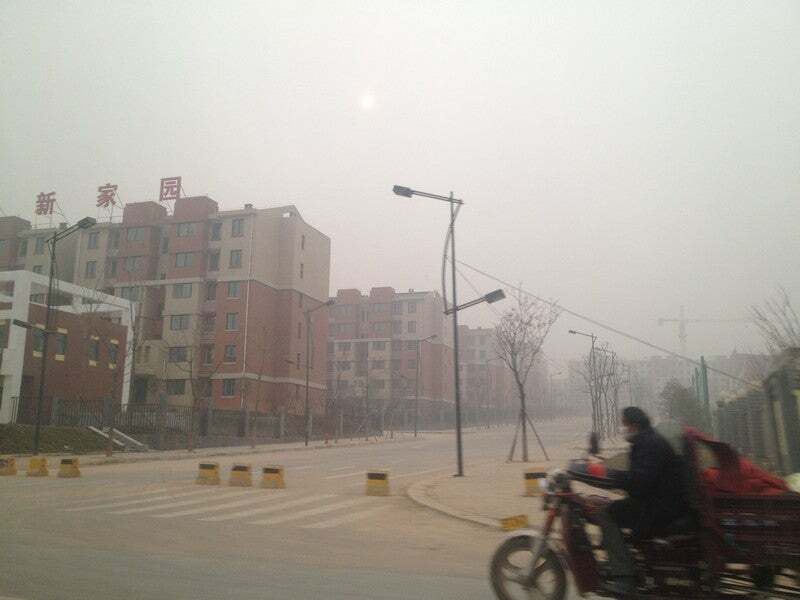 So this is why everyone says it can get so smoggy in China. With a good feel for some of the big tourist sights, I decided it was time to get back to the hotel for a little work—and a cocktail and canapé in the Sheraton Xian’s Club Lounge (more on that tomorrow)—before heading back out to dinner. It was a long day, and quite frankly, it was extremely smoggy and grimy out so I was ready to be back inside. 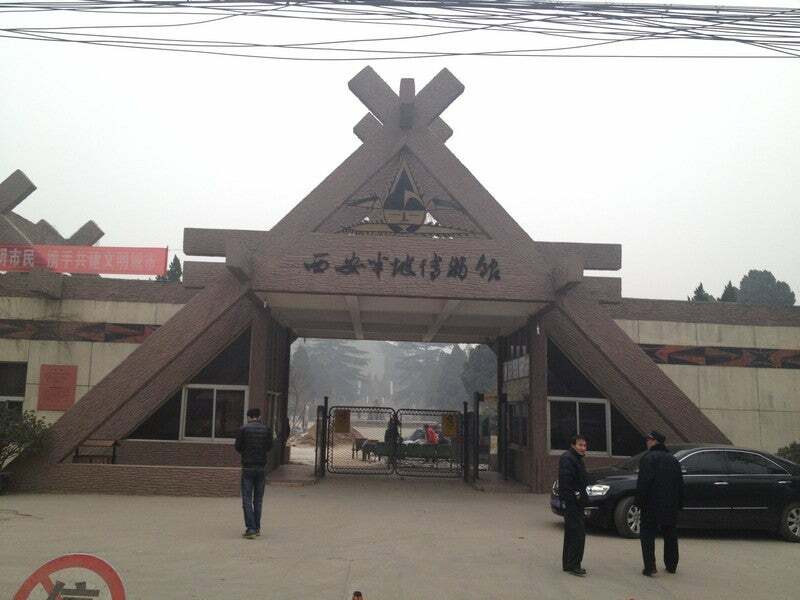 But I was really glad I’d made a stop in Xian and gotten to see its famous terra cotta guardians. The foundations of houses in the Banpo Village Museum. It was freezing in there! One of the Banpo houses–it’s smaller than a New York City studio! 6,000-year-old human remains at Banpo. A new section of the Banpo Museum under construction. Each warrior had to be rebuilt since they were all smashed when they stumbled into this huge ruin in the 1970s. The statue of seven horses outside the Terra Cotta Warrior Museum.